Since 1971, HJC has specialized in manufacturing motorcycle helmets exclusively. 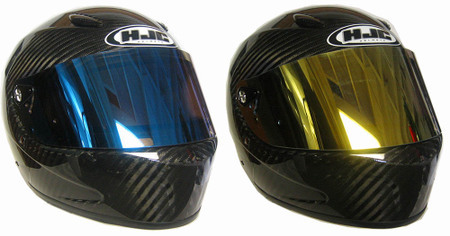 The combination of their extensive specialized manufacturing experience, innovative ideas, and reasonable pricing resulted in HJC’s current line of automotive helmets, and the Snell SA2005 rated HJC HX-10 carbon fiber model is their first to feature a high-tech lightweight carbon fiber shell. This shell, which is made out of an advanced Carbon Fiber Composite Weave, is extremely lightweight and durable. In fact, the HX-10 is one of the lightest full face helmets we carry, weighing in at around 3lbs for a size Large. For those of you that wear, or plan to wear, a HANS® device, the shell is pre-drilled for HANS® posts. The HX-10 also features HJC's "ACS" Advanced Channeling Ventilation System which provides full front to back airflow to flush heat and humidity up and out of the helmet. This system consists of two adjustable vents on the top front of the helmet and two rear exhaust ports. Inside the helmet, HJC used advanced CAD technology to help provide superior fit and comfort. The fire resistant Nomex liner is moisture-wicking, comfortable, and fully removable and washable. Optional cheek pad sets, and even the headliner, can be purchased separately. The clear shield that comes standard on the HX-10 is a polycarbonate anti-fog and anti-scratch model that provides 95% UV protection. Optional R.S.T. shields are available in dark smoke, silver, and blue. Like all HJC helmets, the fit and finish of the HX-10 is top notch and the carbon fiber material results in one of the trickest looking helmets on the market. If you are in the market for a super lightweight and durable auto racing helmet, the HJC HX-10 should definitely be on your list. - Advanced Carbon Fiber Composite Weave Shell: Super lightweight.